This walk centres on UCL & the University of London. Besides college and hospital buildings it includes some lesser known museums and collections that are open to the public. The 4½ mile walk begins at Warren Street tube station (Northern & Victoria lines) a short distance from Euston Square (Circle, Hammersmith & Metropolitan) and finishes near Euston with Goodge Street and Russell Square on the route. If you are visiting attractions you may not want to do the whole walk. There are plenty of places for refreshments. On the left is the Smugglers Tavern formerly the Marquis of Cornwallis. 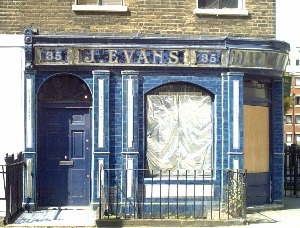 On the corner with Fitzroy Street is French's Theatre Bookshop and on the corner with Conway Street is the old Evans Dairy with blue glazed tiles (pictured in header). The north side was built in the 1820s but includes St Luke's Hospital for the clergy of 1904. The east and south sides of the 1790s are by Robert Adam. Number 6 houses the Georgian Group [website] and on the south side is the London Foot Hospital. Continue across Howland Street along Charlotte Street and left at Scala Street. Its name recalls the nearby Scala Theatre. At the end of this street with its 18th century houses is Pollock's Toy Museum. Go right along Tottenham Court Road. From here there is a view of the Centrepoint tower. On the corner with Goodge Street notice the former premises of Catesby's Linoland and on the corner of Windmill Street the ornate Rising Sun pub of 1897. At the far end is the Eisenhower Centre a former deep-level shelter and D-Day communications centre, linked to the Cabinet War Rooms by pneumatic dispatch tube, and now used as security archives. Behind this in North Cresent is Minera House another former garage & car showroom. On the right are the Drill Hall and RADA premises. The former Duke of Wellington pub has now been dedicated to Jeremy Bentham, the philosopher associated with UCL. The cruciform building on the left was designed by Alfred Waterhouse in 1896 for University College Hospital. It closed in 1995 and was refurbished for UCL. A laboratory which was once the children's ward retains its nursery rhyme tile panels. Gower Street has the main frontage of UCL designed by William Wilkins in 1829. It houses the mummified remains of Jeremy Bentham [more info] and the Strang Print Room. It was used for location filming in the TV series 'Silent Witness'. On the right are the premises of RADA. The box office sells tickets for student productions and the cafe is open to all. Tours of the building are available by arrangement (charge). Further along the School of Hygiene & Tropical Medicine occupies one of the many sites proposed for a National Theatre. On the left is the Senate House of 1932 by Charles Holden which houses the University of London's administration. On the right are the King Edward VII galleries of the British Museum. This has been much improved by the opening of the Great Court. A cafe is located in this square which has undergone restoration. Across from this is the Russell Hotel of 1898. Number 7-11 occupies a multi-level garage built for Daimler Car Hire in 1931 by Wallis Gilbert & Partners in Art Deco style. At the end go left into Guilford Street and right into Queen Square. Located here is the Mary Ward Centre and the church of St George the Martyr with its schools in Old Gloucester Street. The Queen's Larder pub records the fact that Queen Charlotte stored delicacies here for her husband George III who was undergoing medical treatment nearby. The Children's hospital on the left has a statue to Peter Pan at the entrance (JM Barrie bequeathed the royalties from this book to the hospital). Inside is the Byzantine style Chapel of St Christopher designed by EM Barry and moved from the old building! To the right in Rugby Street a former dairy was the site of White's Conduit and in Long Yard a plaque marks the site of Lamb's Conduit, supplied by a tributary of the Fleet. The Foundling Museum is housed in 40 Brunswick Square with a statue of Thomas Corum outside. Go right at Hunter Street and right along Handel Street then walk through St George's Gardens ahead. These were made into a public park in 1885 having served as a burial ground for St George the Martyr, Queen Square & St George's Bloomsbury since 1713 (see information boards). There is a terracotta statue of Eutrepe, the muse of instrumental music, from the Apollo Inn of 1898 on Tottenham Court Road (demolished 1961). Bear left to exit into Sidmouth Street and go left through Regent Square and Tavistock Place. Go right at Marchmont Street and left around Cartwright Gardens. This was originally called Burton Crescent, having been designed by James Burton in 1807. They were re-named after the political reformer Major John Cartwright who lived at number 37 and is commemorated with a statue. On the right is The Place dance studios & theatre. On the right is St Pancras Church of 1822 in Greek revival style. This was the most expensive church of its time. Wellcome Trust Gallery with changing exhibitions at 210 Euston Road (free). BOC Museum* at 9 Bedford Square (free). Grant Museum* at UCL's Darwin Building (free). Dickens House Museum at 48 Doughty Street (charge). Both Camden History Society publications [website]. They are available to purchase at Camden Local Studies (see below). The Friends of St George's Gardens can be contacted at 62 Marchmont Street WC1N 1AB.